Guest Lecture by Dr.Pratibha Ramani in the IAOMP PG Convention, SRMC Chennai, July 2018. Histopathology Slide Reading Series Part III on " Soft Tissue Pathology" . Resource Persons were Dr. M. Vidyalakshmi MD, Assoc. Professor,Department of General Pathology, PSG Institue of Medical Sciences, Dr. M.P.Brundha MD, DNB, HOD in Charge, Department of General Pathology, Saveetha Dental College. Hands - on workshop on ELISA - Biomarker Quantification - Saveetha Dental College, March 21 2019. Basics of infection control & hand washing techniques - Saveetha Dental College, March 16 2019. 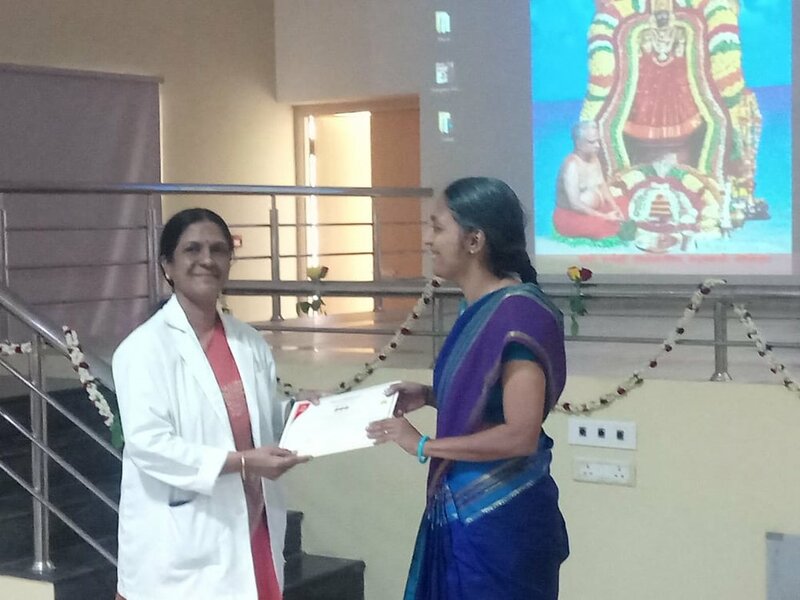 Triple O Symposium 2019 on tumors of jaw bones, Adhiparasakthi Dental College and Hospitals, 14 March 2019. CME on HORIZON 2019:The epitome of Biomedical Research, Saveetha Dental College, February 28 & March 1 2019. Integrated learning on Oral Squamous Cell Carcinoma - Saveetha Dental College, February 22 2019. Lasers in oral and maxillofacial pathology - Hands on - Thai Moogambigai Dental College, February 18,2019. VII National Rapid review programme - SCOPE, Sri Ramachandra Dental college 23-25 January, 2019. 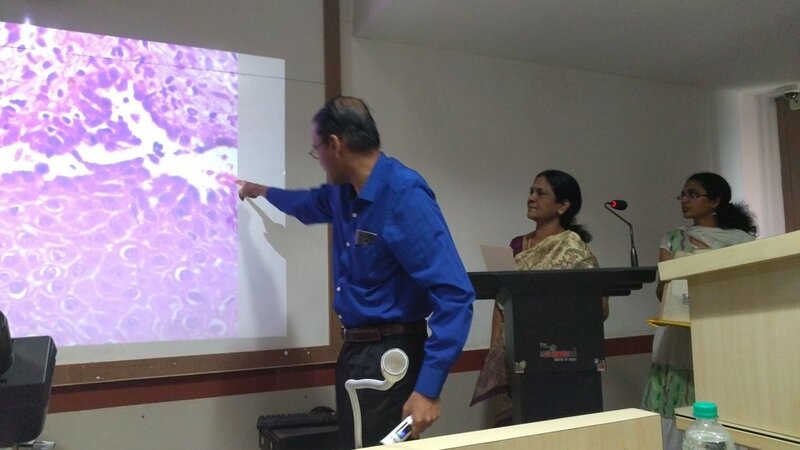 Research priorities in oral precancerous and cancer - Rajah Muthiah Dental College & Hospital, January 2019. Research and clinical applications of Stem Cells - Recent Updates, Saveetha Dental College, 14 December 2018. CDE Programme, Meenakshi Ammal Dental College, Nov 20, 2018. MICRON 2018, Adhiparasakthi Dental College, 10th October, 2018. Oral Microbiome, Saveetha Dental College, 6 September 2018. Community based dental education at UKZN, Saveetha Dental College, 13 March, 2018. VI National Rapid review programme - SCOPE, Sri Ramachandra Dental college 29-31 January, 2018. IX Interactive Histopathology Slide Seminar, SRMC,10 November 2017. Basics in Immunohistochemistry - A workshop, Saveetha Medical College, 5 October 2017. NUTRIGENOMICS - New directions for health promotion,biochemistry - Saveetha dental college, June 2017. SPACE IMMUNOLOGY,Oral medicine -Saveetha dental college, April 2017. TRAIN THE TRAINERS,PEDODONTICS at Saveetha Dental College, on 7th April 2017. AN INSIGHT INTO BREAST CANCER,General Pathology - Saveetha Dental College, February 2017. ANAEROBIC INFECTIONs: Current challenges and Newer approaches, Department of Microbiology - Saveetha Dental College, January 2017.